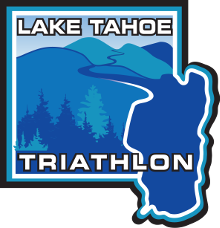 Swim: The swim courses are rectangular-shaped courses in Lake Tahoe. Corners are marked by large buoys. Starting at the Beach north of the pier there are three right hand turns and then a final left to line you up for the exit. The swim exit is south of the start. Exit the water and head up a short ways to the transition area. The average water temperature of Lake Tahoe in August is 67-70 degrees. Wetsuits are optional. The swim course maps are posted on our Course Maps page. Bike: The HALF bike course takes place on HWY 89. The entire course is paved. The course heads out of the transition area at Sugar Pine Point, turns right or north on HWY 89 for an 8 mile out and back loop that you ride twice for a total of 32 miles. Once completing the two loops north of the Sugar Pine Point entrance the course then heads south 12 miles to the same turnaround as the Olympic course. On the way back to the transition area merge right off of HWY 89 to the bike path a few hundred feet south of the entrance to Sugar Pine Point. Run: The HALF run course features a 13.1 mile run. Heading out of the transition area the course heads north on the Rod Beaudry Trail. Soon after crossing over General Creek the course heads onto the scenic lake shore Dolder Nature Trail. It then turns right back onto the Rod Beaudry Trail and continues west crossing HWY 89. From there the course continues on a paved pathway on a scenic route through the Sugar Pine Campground. Then the course heads in a counter clockwise direction out onto the General Creek Trail. At the second General Creek crossing the course heads back on the south side of General Creek to the first crossing. Here the course heads out on a second counter clockwise lap on the General Creek Trail. There is also an out and back section to create the proper distance. It crosses back over the the south side of the creek and soon onto a scenic and fun single track that leads back to the HWY 89 crossing. From here the course take the Rod Beaudry Trail back to the finish. You will pass 8 aid stations while on the run: one as you leave the transition area and the others out on the course.